So you are officially an entrepreneur looking to get your newly created business found on the interwebs – especially on Google. Or perhaps you’re an established local business who just happened to notice that your company’s name is not coming up when potential customers search for your products and services. Either way, if you need to attract customers to your business from within a particular geographic region, this article is for you. Have you ever noticed that when you search for a local business, such as “electrician in Morristown, NJ,” that a set of Google Maps listings comes up on the first page of Google results, often higher than the rest of the results? 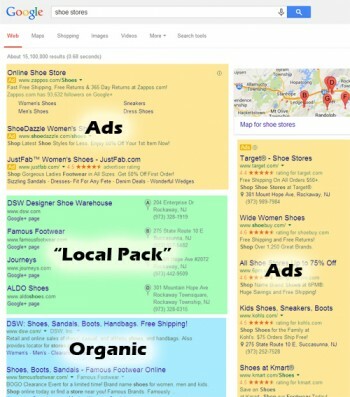 In the search engine industry, this is referred to as the “local pack.” This pack of Google maps results has a different set of ranking algorithms than the typical search results. This article will explain the steps a local business needs to take in order to optimize their exposure in that local pack. 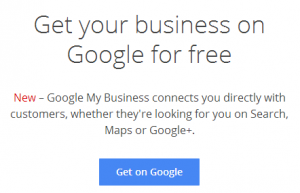 Google recently unveiled the Google My Business platform for local businesses. We highly recommend this be your very first stop in your journey to local business SEO fame and fortune. In Google My Business, you will be able to claim your business listing (a.k.a. Google Maps Listing, Google Places Listing, or Google Plus Local Business Page) that Google may or may not have already created for you. Google creates maps listings for local businesses because Google wants as much information as possible for its own use. Therefore, you may have a Google Maps/Places/Local listing already out there. (P.S. Google likes to constantly change the name of things if you haven’t already noticed). The easiest way to find your Google listing if is to go to http://www.google.com/business/ and click on “Get on Google.” Then search for your business name. If it does exist, you can follow their instructions for claiming your business. They may tell you that they need to “create a Google+ page.” Go ahead and do that, then proceed on to the verification process. You can verify your listing in one of two ways in most instances. One is immediately over the telephone. Google will call your business phone number if you choose this option, so make sure you’re in the office at the time. The second verification option is to verify by postcard. Google will send a postcard to your business address with a 6 digit pin number on it. You will then enter that pin number into your dashboard on Google My Business. If you have any trouble with this process, you can actually call Google for support, and they are actually quite helpful (shocking, right?). Now that you are verified, you should see a check mark next to your business name on your Google Maps/Places/Local listing page. Then it’s time to optimize. First, fill out your business description to 100% completion. This includes hours of operation, business description, and most importantly (for SEO’s sake) is the category. Choose all categories that you think are relevant. You can only choose from the categories that Google provides, so if you don’t fit exactly into what is there just pick categories that are as closely relevant as possible. Also be sure to include a few key phrases in your business description written in the way that people may type them into Google. For example, people likely type in “plumbing company in Morristown, NJ.” You can work that naturally into a description, e.g. “We are a plumbing company in Morristown, NJ.” Don’t “keyword stuff” or overdo it, but include two or three good phrases in that manner. Next, make your listing look pretty. You have two spots in which you can add photos: a profile picture and a cover image. Be sure to add both. We suggest a logo for the profile photo and something snazzy and eye-catching that represents your business for the cover photo. The next couple of tasks in optimizing for local business SEO involve editing your website. Hopefully you have a relationship with a trusty web developer, but if you don’t, let us know and we can recommend some great ones. The first local business SEO edit for your site is adding Schema markup to your business address. Just by crawling your website, Google doesn’t know with any amount of precision where exactly your company is located geographically. Schema markup refers to a set of behind-the-scenes code tags that can let Google and other search engines know precisely where your business is located. In fact, using Schema markup is probably the only thing Google, Yahoo, & Bing have publicly agreed with each other on as an SEO best practice. To keep this task simple, we suggest heading over to a schema tag creator. One that is super easy to use is microdatagenerator.com. This one is good because it lets you choose from some specific business types, such as Attorney or Physician. Schema-Creator.org is another good easy-to-use option. If you have a WordPress website, you can try using the All In One Schema.org Rich Snippets plugin. Regardless of which tool you use, you’ll end up with a snippet of code to place on your website. It is best placed in the footer of your website so that it appears on every page. Schema markup can also be applied to many other things on your website besides your business address, but that is a topic for another blog post. The next website edit that is needed for local business SEO success is adjusting one of the meta tags on your homepage. In your homepage title tag, we suggest putting your company’s city and state at the end of the title tag. For example if you are a widget maker in Philadelphia your title tag would read “Widget Maker – Philadelphia, PA.” This reinforces Google’s certainty of your company’s geographic location. Another local business SEO tactic that works well is creating a local landing page for each location of your business, and perhaps focus it on a specific service or product that you provide. For a business with one location, this could just mean making enhancements to your “Contact Us” or “Directions to our Office” page. This local landing page guide by Nifty Marketing lays out all the necessary components for this type of local business landing page. If you don’t have locations in all of the regions that you wish to target, then you can create pages about how your company serves those locations. For example, if your business is located in Hardyston, NJ but serves many clients from Vernon, NJ, you can make a page specifically about how people from Vernon love to come to your location. Just don’t overdo it with this concept. Focus on creating just a few pages for only the most important regions, and be sure that the copywriting on each of these pages is 100% unique from the other. For this to help (as opposed to hurt) your local business SEO efforts, it is important not to create boilerplate copy and just swap out city names. What the heck is a citation? Citations in this context are business listings around the web that Google gathers information from to use as part of their ranking algorithm for the “local pack.” Typically these are on “online phone book” sites like Superpages.com, YellowPages.com, YellowBook.com, etc. There are also industry-specific sites that you can obtain citations from, depending upon the nature of your business. Technically, these are referred to as “NAP” citations, which refers to Name, Address, Phone Number. Anywhere on the web that lists your company’s name, address, and phone number is a citation. A link to your website isn’t necessarily the important thing in this case. Consistency between the “NAP” portions of the listings is what is most important for local business SEO. If you have changed your company’s name, address, or phone number over time, you may have some cleanup work to do in addition to expanding your citation profile. You can manually sign up for citations one-by-one by going to each site and completing their sign up process, but this is incredibly time consuming and can end up costing you more in individual listing fees than if you work with an agency. Local business SEO agencies (like Pam Ann Marketing) use tools that syndicate hundreds of citations at once, saving you time and money. After the agency “blasts out” your new citations to hundreds of sites at once, there is still some ongoing work to do. Working on eliminating duplicate listings and correcting inconsistencies, as well as adding new niche industry citations on a regular basis is important. Be sure to ask for monthly reports to see the progress of the work that any agency is doing for you on a regular basis. How do you get people to leave you reviews on Google? Well, first of all – ask for them! Put a “review us on Google” message on your website, on receipts, on invoices, on phone hold music, in email signatures, in window signs, anywhere and everywhere. You can also personally ask your happiest customers to do you a small favor by leaving you a Google review. If they are confused on how to do so, you can create a “how to” guide to step them through the process. All local business SEO clients of Pam Ann Marketing will have such a guide custom created for them. Side note: You can’t slide fake reviews past Google – they’re way better at catching that than you might think. The reviews need to be genuine, but they also need to be positive in order for them to help as opposed to hurt your local business SEO efforts. If you’re concerned about receiving less-than-stellar reviews, give people two options: one for giving feedback, and one for leaving a positive testimonial – and point them in two DIFFERENT directions. Point people who want to give feedback, which is likely not positive, to a private survey form. Point those who want to rave about you to your Google listing to leave their five star review there for all (especially Google) to see. We call this “the hard part” because it’s the only part you don’t have direct control over. Regardless of how much you beg and plead, only a certain number of your customers will go out of their way to write you a review. Which simply means that it is incredibly important to ALWAYS be asking. If you let off the throttle on the constant asking, then soon you will be out-ranked by your competitor who didn’t. Therefore, asking for reviews is a tactic that should have a permanent place in your workflow and marketing efforts. That’s it! Those seven steps are the core components of local business SEO success as of mid-2014. Following these steps will increase your exposure on the web without having to perform extensive optimization work on your whole website. However, local business SEO, just like all aspects of digital marketing, is always evolving. Although you can do most or all of what we laid out here yourself, working side-by-side with an SEO agency (like Pam Ann Marketing) on an ongoing basis will ensure that you are always one step ahead of your competition when the search engine landscape changes again, which it likely already has since we wrote this. Want to know just how well your local business SEO presence is? Contact us for a free local business SEO audit. We’ll take a look at your unique situation and review it with you so that you can make an informed decision on how to go about improving it. Just put “local business SEO audit” in the subject line of your message and we will be in touch promptly.